Participate at the world’s only countering drones conference dedicated to the security community. The Gatwick incident in December has brought the subject of security against drones sharply back into focus. 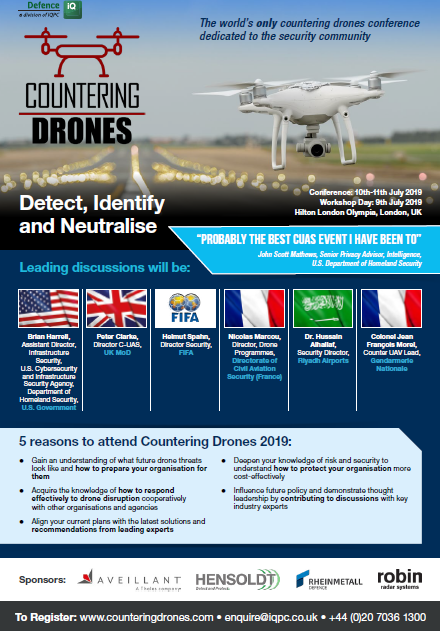 This July, our panel of experts at the Countering Drones Conference will be discussing the most pressing issues surrounding threat, risk, resilience, technology and incident response. U.S. Government, UK MoD, FIFA, Directorate of Civil Aviation Security (France), Riyadh Airports, Gendarmerie Nationale, plus many others have confirmed their participation. Complete the form to your right to download the full 2019 agenda, with the complete speaker line-up.